Notes extracted from Ann Arbor City Council Minutes. 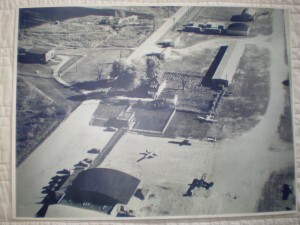 May 1936 – “Gentlemen – Your Park and Sanitary Committee respectfully recommends that $200.00 be appropriated from unappropriated funds to the Airport fund of the Park Department for the purchase of materials necessary to complete the administration building at the Municipal Airport.” Hammett, Masten, Mayer, Shaw, Young, Staffan, Park and Sanitary Committee Members. This property is important because it is associated with significant historic events. The building was reconstructed over a nearly 10 year period by membership volunteers of Experimental Aviation Association Chapter 333. The size, location, and of the building remain unchanged, however, modern materials and construction methods, as well as current building codes were used to update the structure. In return for in-kind contributions of expertise, labor, and materials, EAA Chapter 333 was given a favorable lease.